This article is 2622 days old. This will be an chance for Olde Walkerville’s residents to engage with both the city planner Thom Hunt and heritage planner John Calhoun. The hope is to give a better understanding of the legislation and by-laws Windsor has in place that affect the health and well-being of the community. 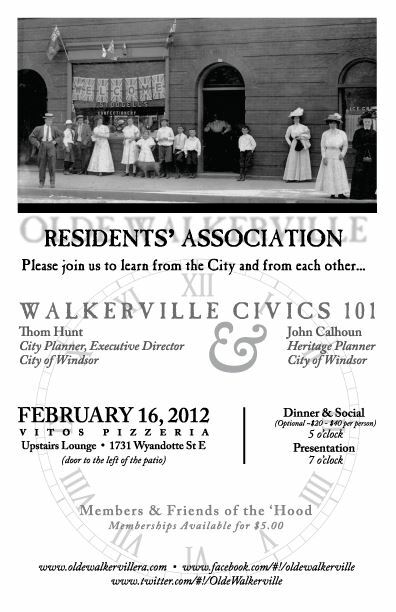 Olde Walkerville’s built heritage has been identified by the members of the OWRA as being the number one reason they’ve chosen to live in the neighbourhood. There are many municipal tools that are available to us to better achieve some of our stated goals of maintaining the character of Olde Walkerville based on its unique history, preserving and/or enhancing our culturally and historically significant buildings, architecture and spaces, green space, parks, and trails within the community, and enhancing the livability and quality of the Olde Walkerville neighbourhood. It is timed we learned how best to utilize them, so we’re bringing in the experts to explain. The event takes place at the upstairs Lounge of Vito’s Pizzeria located at 1731 Wyandotte Street East (door to the left of the patio). Dinner and social time starts at 5pm (optional – off Vito’s menu) and the meeting starts at 7pm.